As a weight loss consultant, I have literally dealt with 100’s (actually, probably more like 1000’s) of clients who have come to see me to get help in reaching their goal weight. It’s a very rewarding job when your client succeeds however, it can be equally frustrating when they don’t. 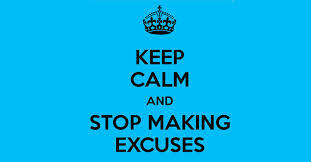 This week, I want to discuss the two most common excuses that I hear in the clinic every week, and how I respond to them. I haven’t got time: In the past, I have had busy mums who juggle working full-time, managing the kids while taking care of all the domestic duties who have lost weight beautifully with me: so if they can do it, anybody can . Everyone has the same 24-hours in a day to get things done. So if you haven’t got time to prepare healthy meals or exercise (or both), then what are you really spending your time doing? Closely analyse how you spend your days and nights: If you find you spend a few hours at night on the couch watching TV or looking at social media, then this is the ‘time’ you can afford to use to get healthier. I’m too tired: This is probably the second most common excuse I hear in the clinic. It is often used when a client makes a bad food choice or hasn’t done any exercise for the week. If you genuinely wake up tired most days, then you need to look at the reasons why this is happening – get a blood test to make sure you are not low in iron or B12 or important hormones (such as thyroxine). It may be that you are simply going to bed too late: be sure to turn off your phone, computer, and the TV at least an hour before bed as the blue light emitted from these devices interferes with melatonin, the hormone that helps you fall and stay asleep. Though you may wake up ‘tired’ (and let’s face it, some of us are simply not ‘morning’ people), the best way to overcome it is have a brisk 30-minute walk. This get the blood circulating and you enjoy sucking in a lot of fresh oxygen which is a great energiser for your muscles and brain. I am a naturopath for The Natural Way. This entry was posted in Reasons to lose weight, weight loss, weight loss excuses and tagged excuses, healthy-living, lifestyle issues, weight loss, weight loss excuses. Bookmark the permalink.